You’ve dreamed of the sparkling blue waters of the Aegean Sea and the white houses of the Greek Islands. Now you can have both with a guided tour of Greece with a Greek Island cruise. History comes alive on your guided visits to many of Greece's ancient sites. In addition to the Acropolis and Olympia, you'll also visit the ruins in Mycenae, dating from 1,350 to 1,200 BC and described in Homer’s epic poem, “The Iliad.” Also see the amazingly well-preserved, 2,300-year-old open-air theater in Epidaurus. In ancient Greece, people traveled to Delphi to seek the wisdom of the Oracle. Learn about the Oracle, tour the excavations, and visit the Archaeological Museum. To add to your Greek experience, enjoy a cooking demonstration where you learn to make traditional tzatziki; take a sirtaki dance lesson; and try a glass of ouzo. Plus, you'll be accompanied by an expert Tour Director who will bring this country to life by sharing its history, stories, and insider secrets. 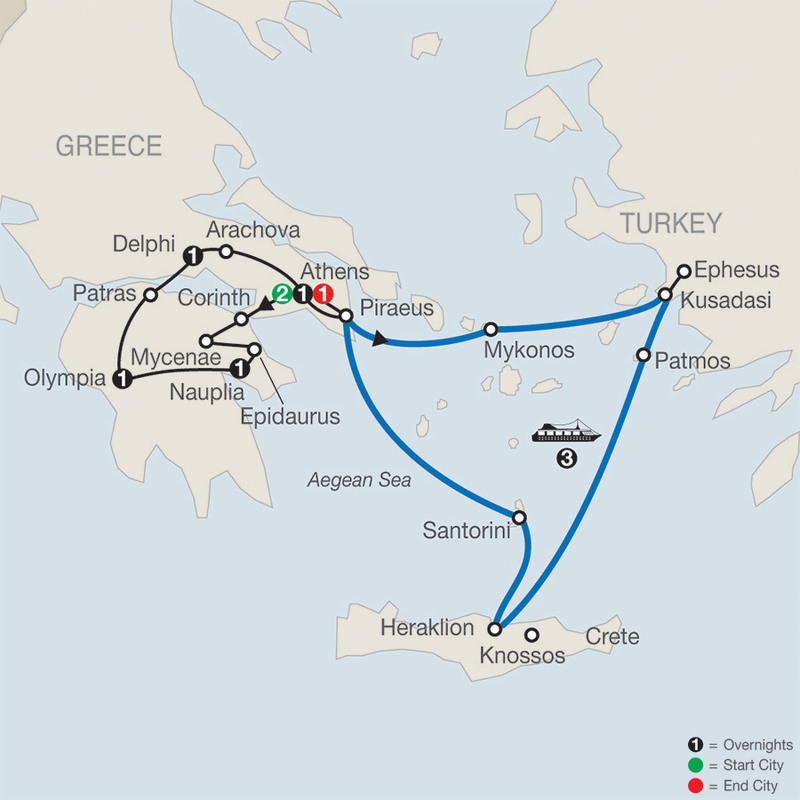 Your Mediterranean vacation continues with a 3-night Greek cruise on the Aegean Sea! Sail from Athens aboard a Celestyal Cruise ship to dock on the legendary island of Mykonos. Wander amid its iconic windmills and white houses. Next, you’ll sail towards the shores of Turkey to visit Kusadasi and the ancient excavations of Ephesus. Discover the tiny Greek island of Patmos, then on to the island of Crete to explore Knossos the center of the 3,000 BC Minoan civilization. You’ll also sail, weather permitting, to the panoramic and volcanic island of Santorini—“The Black Pearl of the Aegean.” Relax while basking in the beauty of the sea as you return to Athens. From the picturesque fishing villages to ancient historic sights and sailing the Aegean Sea, this Greek cruise and tour vacation has it all! DAY 8 CRUISING: KUSADASI, TURKEY-PATMOS, GREECE. DAY 9 CRUISING: HERAKLION, CRETE-SANTORINI, GREECE. Select departures of this tour will operate the land portion in reverse. All inclusions per itinerary remain the same. Gratuities to service personnel on board and port taxes are included. Rotation of ports of call may vary for congestion reasons at certain ports with or without prior notice. Outside cabin (category XB) - All cabins with two lower beds and private shower and toilet. Full entertainment program on board. Drink package: selection of non-alcoholic & alcoholic drinks. Please ask your Travel Consultant for cruise ship details. The ship scheduled to depart for the cruise portion of your vacation is the Celestyal Olympia, operated by Celestyal Cruises. Headsets on the land portion. Attractive 7-story Hotel situated near museums, 1 km from Larisis train station & 35 km from El. Venizelos Airport. Neoclassical-style Hotel situated on tree-lined grounds with landscaped courtyards, 1 mile from city center. Hotels Europa is built on the top of Drouvas Hill in Ancient Olympia (UNESCO World Heritage Site), at the foot of which is sited the Sacred Alti with brilliant monuments and the stadium of the Ancient Olympic Games. Hillside Hotel situated on a mountain slope overlooking olive groves, the Corinthian Gulf & the port of Itea.